On January 22nd, in 2019, Resident Representative of JICA Chile, Mr. Ryozo Hanya, visited Instituto Tecnológico del Salmón (INTESAL; Salmon Technology Institute). INTESAL is one of our collaborating members from private sectors along with Instituto Tecnológico de Mitilicultura (INTEMIT; Technological Institute of Mussel Farming) (Direct Collaborating Entity II (Private Sector); link). Dr. Kyoko Yarimizu (NRIFS, Japan, staying at IFOP), Dr. Mikihiko Kawai (Kyoto Univ., staying at UFRO) and Mr. Yuji Misu (MACH project coordinator) accompanied him. From INTESAL, Dr. Paulina Artacho (Research and Development Management) and Dr. Daniel Jimenez (Health & Analysis Manager) attended the meeting and explained to us their activities including environmental and HAB monitoring, public relations, and communication activities (e.g. seminars on salmon aquaculture) to associated members and the Chilean community. 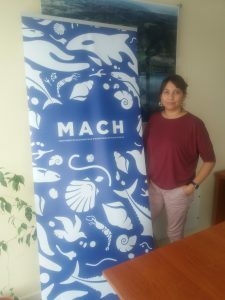 INTESAL is a scientific-technical branch of Salmon Chile, which is the main salmon industry association in Chile that includes salmon producers and suppliers. Dr. Yarimizu and Dr. Kawai explained their roles in our project, our research foci, progresses made at IFOP and UFRO, and so on. To facilitate public relations with INTESAL, Mr. Misu handed them goods of our project such as a banner and leaflets. This visit of Resident Representative of JICA Chile to INTESAL was to show that our project is an international and multidisciplinary project between two countries, Chile and Japan. Both of us agreed to keep in communication with to share progresses of both sides and exchange opinions. In this sense, this meeting is one of our steps to establish an interaction/integrating platform for HAB related organizations to timely inform and allow for the corrective/mitigating actions of involving fishermen, industries, government and academia. We also plan to participate in activities such as seminars to share project results and to promote future evidence-based actions based on scientific facts.